Ditch the plastic bags this Halloween! All it takes are a few fat quarters and a little time and you can make not one, but two Boo! Bags. Your favorite Trick or Treaters can use year after year. Download a free pattern click here. 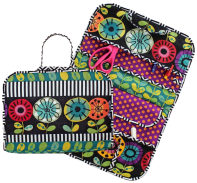 Eazy Peazy will be at Fall Quilt Market in Houston, October 28-30 showing four new patterns. 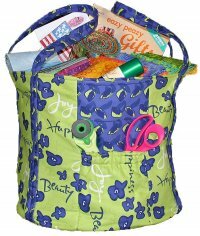 Eazy to make with loads of pockets and perfect for toting sewing supplies and notions to class or make-and-take projects. Useful for you and a perfect gift for your hostess. Thanksgiving, Christmas or anytime—protects your cookwear, counters and hands. 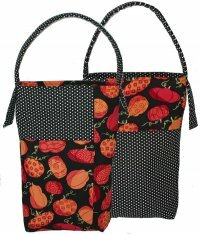 Here’s your “go-to” bag for the big stuff like quilts, blankets, beach items and kids’ necessities. With a stable bottom, it stands on its own and is a standout. 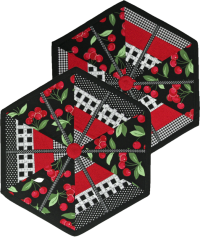 Another Eazy project with the popular hexagon shaped, fusible Bosal Placemat forms. Make a set with 2½” strips plus some fabric strips or ribbon. A great way to use the leftover jelly roll strips. Fall Market -- Stop in and say hello at Booth #1602, our exhibit will be part of Bosal Foam and Fiber. Learn about the important interfacings and stabilizers that give your projects that professional designer look. See how these products adapt themselves to dozens of different uses.